A native of Illinois, President Derry is a 1972 graduate of Lincoln Christian College. While enrolled as a student at LCC, he served as senior minister with the Isabel Christian Church near Lewistown, Illinois and then with Vermont Christian Church in Vermont, Illinois. In 1978 he received a Master of Arts degree from Lincoln Christian Seminary in the area of theology and philosophy and was ordained to the ministry. While a graduate student at LCS, Dr. Derry established a campus ministry at Western Illinois University where he served from 1973 to 1985. During that time he was also an adjunct faculty member for Lincoln Christian College offering extension courses at off-campus sites. In 1983 he completed a Master of Science in Education degree at WIU majoring in educational foundations, followed by additional post-graduate work in the area of educational administration. In 1985 he accepted a call to become Vice President for Student Development at Milligan College in Tennessee. While serving in this capacity, he also completed doctoral work at East Tennessee State University receiving an Ed.D. in 1996 in the area of educational leadership and policy analysis with an emphasis in higher education. 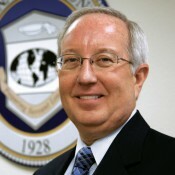 Prior to HIU, he was president of Dallas Christian College since 1998. Seoul Christian University awarded him an Honorary Doctorate of Theology degree in 2005. During his career Dr. Derry has authored articles in professional publications and presented seminars and workshops nationally and internationally on various topics relative to Christian ministry, globalization, and higher education. He has served on the board of directors of such organizations as Communities in Schools, Christian Student Fellowship, Consortium for Service-Learning, Rotary Club, Lincoln Christian College and Seminary Alumni Association, North American Christian Convention, National Missionary Convention, the Association for Christians in Student Development, Provision Ministry Group, Christian Care California, and as an elder in two congregations. He has been listed in Who's Who in America in Religion, Community Leaders and Noteworthy Americans, Outstanding Young Men of America, and is a member of Phi Kappa Phi honor society and Phi Delta Kappa. He was selected as Alumnus of the Year at East Tennessee State University for the department of Educational Leadership, received the Fide et Amore distinguished service award from Milligan College, and the Restoration Award from Lincoln Christian University for service to Christian higher education. During President Derry’s tenure at Hope, he has chaired WASC Senior College and University Commission accreditation visits to other institutions and authored several articles on the future of higher education in the Christian Church. The University has also achieved programmatic accreditation with the Association for Biblical Higher Education and the Commission for the Accreditation of Marriage and Family Therapy Education. Dr. Derry and his wife Jane are members of Eastside Christian Church in Fullerton, CA. They have two children and eight grandchildren.